The Fourmile Canyon Tusk was found on private land about 11.2 km (7 miles) south-southwest of Finley, Washington, and 16 km (10 miles) south of Kennewick, Washington. The tusk was found along the slope of a minor drainage leading into Fourmile Canyon at an elevation of 530 m (1740 ft) above Mean Sea Level (Barton et al. 2012; Last and Barton 2012). 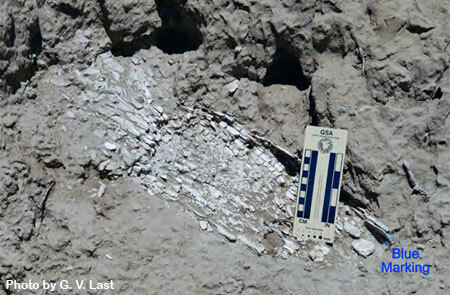 The MCBONES Research Center Foundation directed excavation and recovery of a partial tusk by students from Tri-Cities Prep of Pasco, Washington, under the supervision of instructor Jim Dishon (Kleinknecht et al. 2013). Bill and Kim Mauldin discovered the tusk in late June 2011, while exploring for fossils and scouting for a place do some falconry (i.e. fly their birds of prey). In July 2011, Bill and Kim led several MCBONES volunteers to the site. The tusk was about 8 inches (20 cm) in diameter and was highly friable. Part of the tusk had been tagged with blue paint suggesting that it had been previously discovered -- possibly during National Environmental Policy Act (NEPA) reviews associated with the Nine Canyon Wind Project. 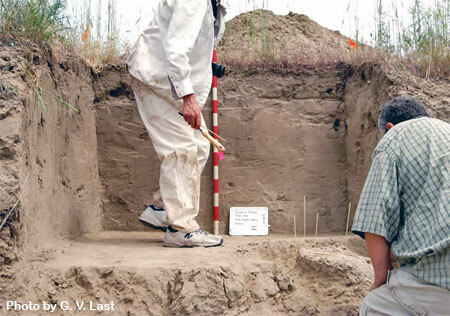 In the spring of 2012, MCBONES staff began working with Tri-Cities Prep science teacher, Jim Dishon, and his students, to excavate a two-meter by two-meter unit that had been staked out over the tusk site. Students were instructed to proceed by digging down to the tusk in 10-centimeter-thick levels. MCBONES provided students with digging and measurement tools. 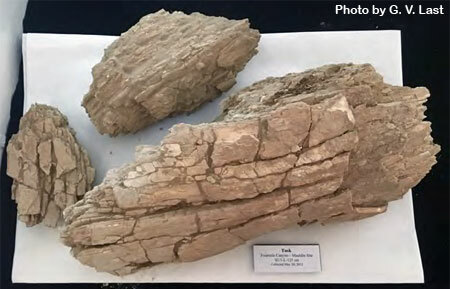 Excavation continued periodically throughout the spring, finally reaching the tusk and revealing the full extent and condition of the 50-cm-long tusk fragment. The condition of the tusk was found to be quite poor. Surficial-exposed growth layers were exfoliating in small pieces. Tri-Cities Prep students carefully removed soil from around the tusk fragment prior to its recovery. The partial tusk was extracted and transported to the MCBONES Coyote Canyon Mammoth Site Dig House for preservation and display. 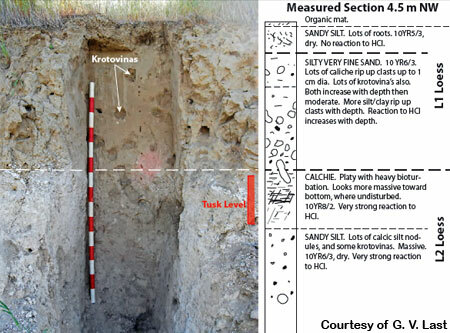 The partial tusk was excavated from at the top of an older loess deposit (L2) with a fairly well developed pedogenic carbonate horizon (Stage III or IV) and was overlain by a thin more recent loess deposit (L1) with weak soil development (Last and Barton 2012). The site is geographically located in an area mapped on regional soil maps as dominated by exposures of the L2 loess (Boling and Busacca, 1998). Optically stimulated luminescence (OSL) studies by Richardson (1998) have suggested an age of 60-35 ka BP for the deposition of L2 loess in the area. The tusk’s location slightly below the contact between the two loess layers suggest an age of approximately 35,000 years before present (Kleinknecht et al. 2013). The tusk itself appears to be leached and lacking in organic carbon, suggesting that radiocarbon dating on the tusk would not yield reliable results. Barton, B. R., G. V. Last, and G. Kleinknecht. 2012. "Mammoths In The Loess of Benton County, Washington." Northwest Scientific Association 2012 Program and Abstracts, March 28-31, 2012, Boise, Idaho, p. 27. Boling, M., B. Frazier, and A. Busacca. 1998. General Soil Map of Washington. Department of Crop and Soil Sciences, Washington State University, Pullman, Washington. Kleinknecht, G., J. Dishon, B. A. Mauldin, G. Last, and B. R. Barton. 2013. 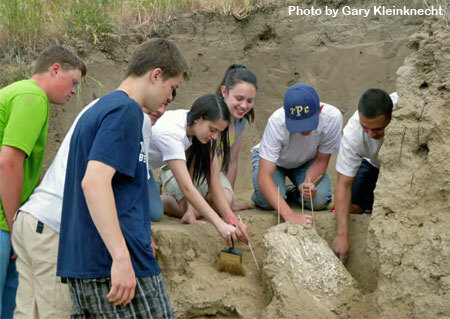 “Excavation of a Late Pleistocene Proboscidean Tusk by High School Students at Four Mile Canyon, Benton County, Washington”. Northwest Scientific Association 2013 Program and Abstracts, March 20-23, 2013, Portland, Oregon, p. 53. Last, G. V., and B. R. Barton. 2012. "Current Excavations Of Mammoths In Benton County, South-Central Washington State." In QRC Loess Conference – Spring Symposium 2012, Richland, Washington.